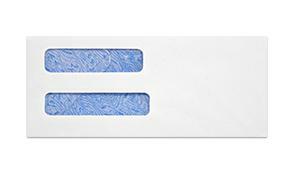 #8 5/8 double window envelopes in 24lb. bright white paper. They feature a blue security tint on the inside to keep their contents private. The closure is a standard moisten to seal gum found on most envelopes. Latex "quick stick" or Peel & Stick can be added to make sealing easier. This custom double window is kept in stock and allows you to show both the mailing address and return address through the front of the envelope. The top window measures 13/16" x 3 1/2" and is 5/8" from the left and 2 3/8" from the bottom of the envelope. The bottom window measures 13/16" x 3 3/4" and is 5/8" from the left and 13/16" from the bottom of the envelope. This saves you money since you won't need to print the return address. Top Window Size 13/16" x 3 1/2"
Bottom Window Size 13/16" x 3 3/4"